This weekly program has teenage volunteers spending quality time with children with special needs in the environment the kids are most comfortable and familiar with: their own homes. A unique bond is established between the volunteers and their friends. The range of activities shared can be anything from cookie-baking to arts & crafts, story-time to hide-and-seek. Parents speak glowingly of how the children look forward to these visits; and how they excitedly sit at the window in anticipation of their buddies showing up at the doorstep. memorable holiday experiences shared together with siblings and parents. And of course our volunteers will be there to give your child personal love and attention. 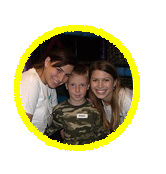 Invite The Friendship Circle to your child’s birthday party! Our friendly volunteers will be there to help run the festivities. Party highlights will include fabulous activities, refreshments and of course… a birthday cake. Happy Birthday! Join an online community of parents of children with special needs for bi-monthly webinars. Enjoy lectures and round-table discussions and meet people from around the globe. Click here for this year's schedule of events.